Notes: Flashback is a former cocaine addict. 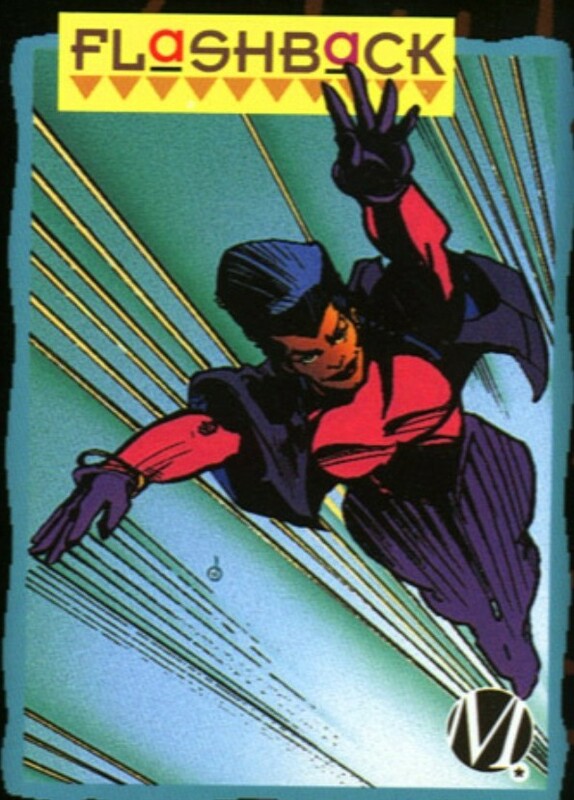 Powers: flashback has the power to time travel with her powers. She however is limited in the type of time travel. She is only able to travel backwards in time by a few seconds. She also shares a symbiotic relationship with her brother fade, anchoring him in time. She can also fly. Flashback joined the Force Syndicate, Dakota’s “Misfit” gang along with her brother Fade when they emigrated from Dominica. At the Big Bang Flashback was one of only a handful of people to survive the massacre. After the incident she gained superhuman powers as one of the “Bang Babies”. She banded together along with her brother Fade and many more “Bang babies” to form the Blood Syndicate. For awhile she dated teammate and then leader Holocaust. Because of the nature of her power she was used as a fail-safe for her teammates when in hectic situations. If anyone was mortally wounded she would travel back in time and prevent them from dyeing. Over time however this took a toll on her psyche since she had memories of all her friends being horrifically killed. To compensate for the nightmares which haunted her she turned to cocaine use. When Holocaust left the team she remained with her friends under the leadership of Wise Son. After Holocaust returned and challenged Wise son for leadership and lost she continued to follow Wise son. After meeting Icon and Rocket she became friends with Rocket who helped her kick her drug addiction.